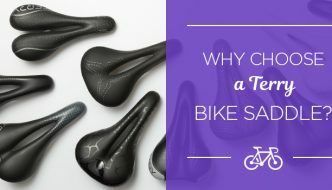 MISADVENTURES: Gear Review: Terry, the Original Women's Bicycle Company. - Terry Peloton. You are here: Home / Terry in the News. 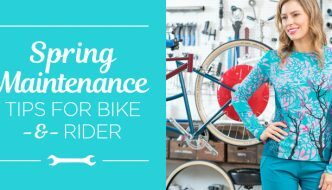 / MISADVENTURES: Gear Review: Terry, the Original Women’s Bicycle Company. 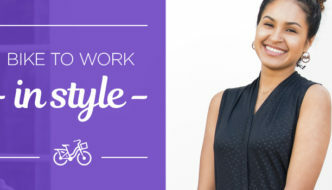 Gear Review: Terry, the Original Women’s Bicycle Company. If you’re a cyclist or want to be, you should know Terry. I must say, without being too graphic, that this saddle feels very comfortable on the lady parts. Ever since I heard that I was losing 70% of the sensation in that region due to biking every day, I’ve been a little worried. This saddle takes the pressure off with its split design, puts two cushions right up under the sit-bones, yet still is a sleek and light performance saddle. My only complaint is that I feel the forward cushion is a bit too rounded — that got uncomfortable at times (front wedgie, again, apologies for the graphic nature of this review. NC-17) — but once I adjusted the angle of my seat and put it forward a hair more than usual, it felt great. I give this saddle FOUR STARS! This shirt is pretty hip. As we get into warmer months, I already foresee this becoming my go-to top for anything active. It’s incredibly light (it feels like you’re not wearing anything at all = ideal), zips down, has spacious pockets, and breaths. Plus, the pattern and colors are nice enough that it looks like you might not be wearing a biking top (my others are neon or Hawaiian print — not exactly versatile…). I wore this to a party under a jacket (because I had been hiking earlier that day) and got some compliments! Dress it up, dress it down. I give this top FIVE STARS! I can’t say enough good things about these babies. If there is one thing from this review that you glean, glean this: these rule. The Coolweather Tights are the biking leggings of my dreams. Padded, warm, durable, water-wicking, not too long (I’m 5’2” — they come in petite! ), not too tight on the waist, they haven’t been stretching out weirdly at the knees though I wore them pretty consistently for about a week, and they are my favorite color (black). These got me through the winter, and for a bike commuter, felt both like a luxury and a necessity. If you live in a chillier place (as in, 40 and below) and you want to keep biking year round, this is the thing for you. ONE MILLION STARS! I must say, these are some next-level bike shorts. At first, I thought, okay, bike shorts are bike shorts. There are a few details here that, if you’re a distance biker or a regular biker, make these worth the price. Number one, the seamless leg bands. They are laser-cut, extremely comfortable and hold everything in place without feel constrictive. Number two, the waistband — yowza! The front is elastic-free. It’s just a smooth band that sits across your waist — very comfortable — and compresses lightly from the back. This is by far my favorite thing about these shorts. If you’ve found other bike attire too tight or too abrasive, especially on a long ride, try these. And they are solidly made. You will not see any tears or wearing for a long, long time, if ever. If you’re planning a long ride or looking for a commuter short, I recommend doing it with these puppies.FOUR STARS! These are not messing around. Where the shorts above excel in unobtrusive comfort, these excel in serious compression. You may notice they’re a little longer than your average short — the effect of that is a feeling I can only describe as whole-leg-energizing. For hard rides with steep climbs or long distances where you’re really pushing yourself, these will keep your muscles feeling good, you legs feeling unchafed, and your ‘vulnerable areas’ feeling airy and relaxed. For the serious biker who is looking for something supportive, perfectly fitted, durable, and comfortable (same waistband as above! ), look no further. FIVE STARS!